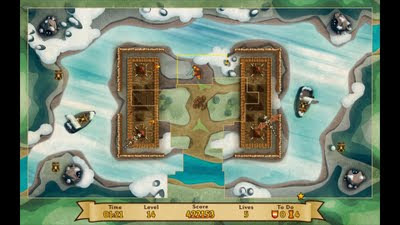 Fortix 2 is the sequel to Fortix, an amazing land grab game which sees you recapturing the land taken by the evil Xitrof. It doesn't take a genius to see that the inspiration is the old school Qix, as you must draw paths across a battlefield, capturing the land that you successfully box off. You play as one of a few characters, ranging from the brave warrior Fortix, to a tank! Starting at the borderline, you must take back the battlefield by drawing lines which eventually join back up to the border. They can be as big or as small as you can manage, but it's no easy task. Dodging dragons, ogres and cannons makes it hard to create areas of any decent size. The difficulty curve for Fortix 2 is quite steep, which may put off some of the more casual players. The game requires patience, quick reactions and many risks, as you race against an oncoming cannonball to finish a box. To help in your quest there are a number of power ups, which can help you along your way. These range from the speed boost, to an enemy stopper, to an extra life. Which one you get is chosen at random but they are all incredibly helpful. The game would be much less entertaining without them. The graphics of Fortix 2 are very simple, as it is a top down game, but the enemies and castles are detailed, and once you capture areas of land back, you can see how colourful the game is. Nemesys have put a lot of effort into the game's art style, and it pays off. Fortix 2 is a great game. Sure, it doesn't last very long, but for the price you certainly get your money's worth, plus you get a whole load of classic levels from the original too. 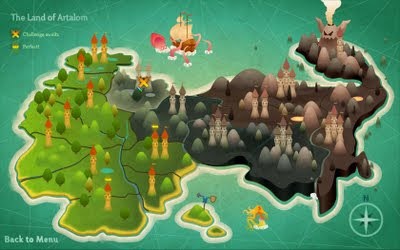 The graphics are cute, the gameplay is simple and the price is low. What more could you ask for?